In the sporting world, Cote d’ Ivoire is well known as a power house in African football , and globally for the production of stars such as Didier Drogba, the Toure brothers (Kolo and Yaya), and a host of other big names. About a decade ago, suggesting that the West African country would produce a female double sprint Silver medallist at the World Championships, and 2014 African champion in the men’s 100m and 200m, would have sounded a bit far-fetched. Cote d’ Ivoire was first put on the world athletics stage in 1984, when Gabriel Tiacoh (RIP) won the 400m silver medal at the 1984 Olympic Games in Los Angeles, before making the final at the 1987 World Championships in Rome. However, the recent strides being recorded by Ivorian sprinters both continentally and internationally are now making the sort of impression that would make Tiacoh proud. 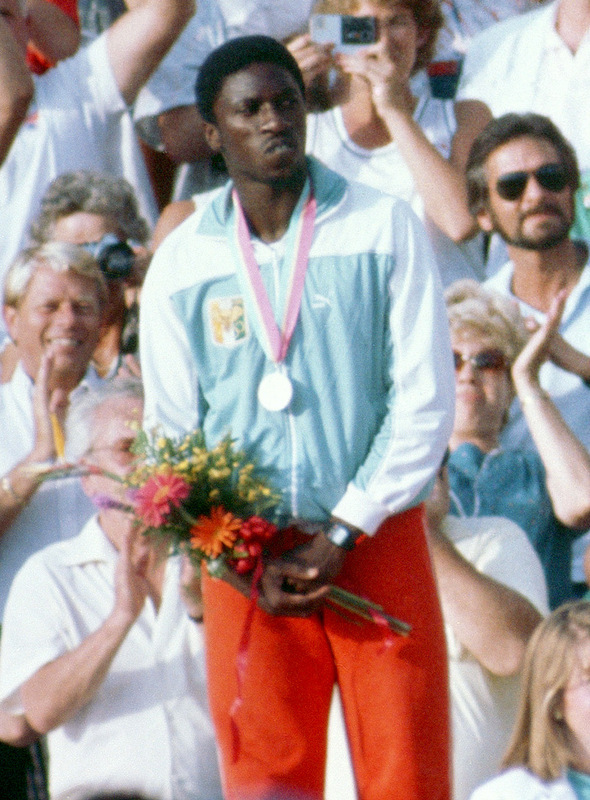 Gabriel Tiacoh won silver in the men’s 400m at the 1984 Olympics, behind USA’s Alonzo Babers. 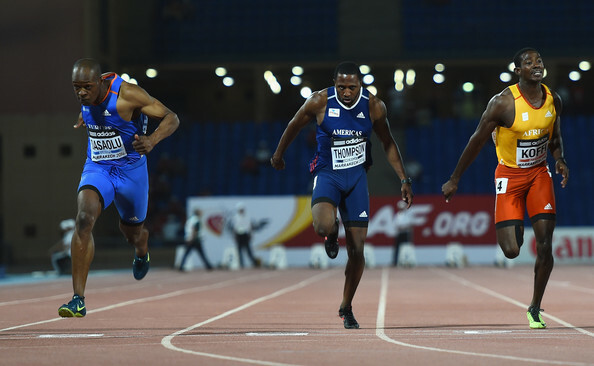 After the civil war in their country, the gradual but steady emergence of Cote d’Ivoire in world sprints started at the 2009 World Championships where Ben Youssef Meite competed in the first round in the 100m where he posted a time of 10.41s. 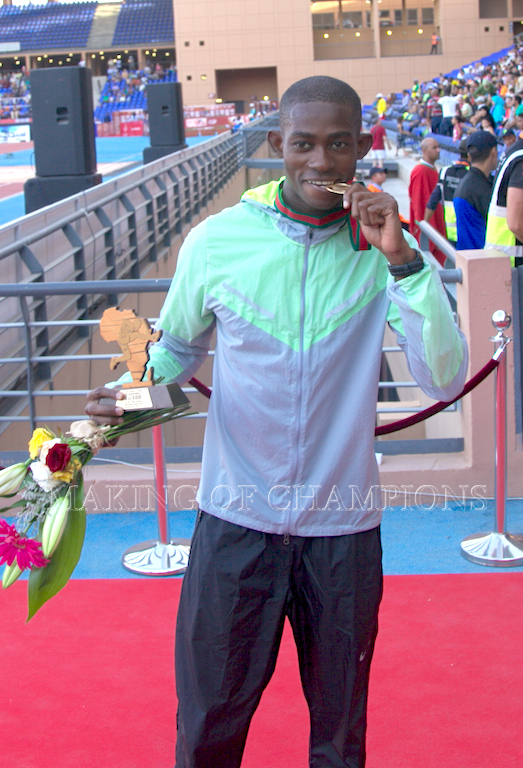 He thereafter denied Nigeria a fourth consecutive victory in the men’s 100m in Africa, as he dominated the event at the 2010 African Championships in a time of 10.08s, before taking silver in the 200m in 20.39s. 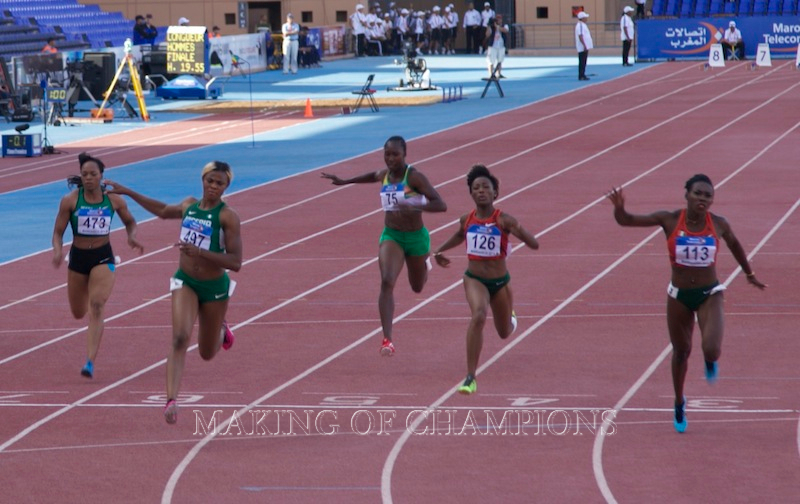 African record holder in the 100m, Olusoji Fasuba, won the event at the 2004, 2006 and 2008 editions of the championship, which was the last time Nigeria struck Gold at the continental championship. 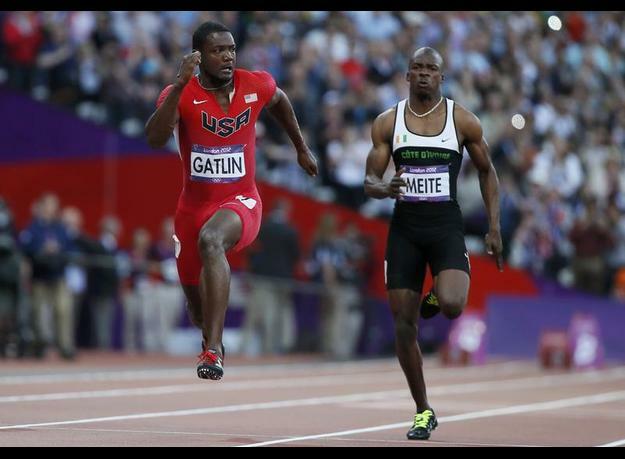 Ben Youssef Meite competed alongside USA’s Justin Gatlin in the men’s 100m semi-final at the London 2012 Olympic Games. In 2012 in Porto Novo, Meite won the Gold medal in the 200m before a semi-final place finish in the 100m at the 2012 Olympic Games in London. 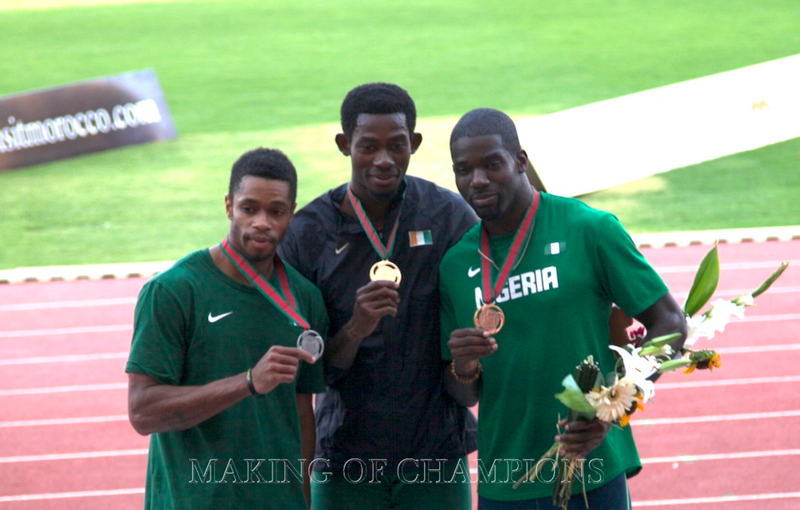 It should be noted that, the last time Nigeria won the men’s 200m at the African Championships was in 2006 when Uche Emedolu stormed to the title. Since then, Ivorian sprinters seem to have taken over, sounding a warning that they’re the ones to beat at the African Championships in the sprints. 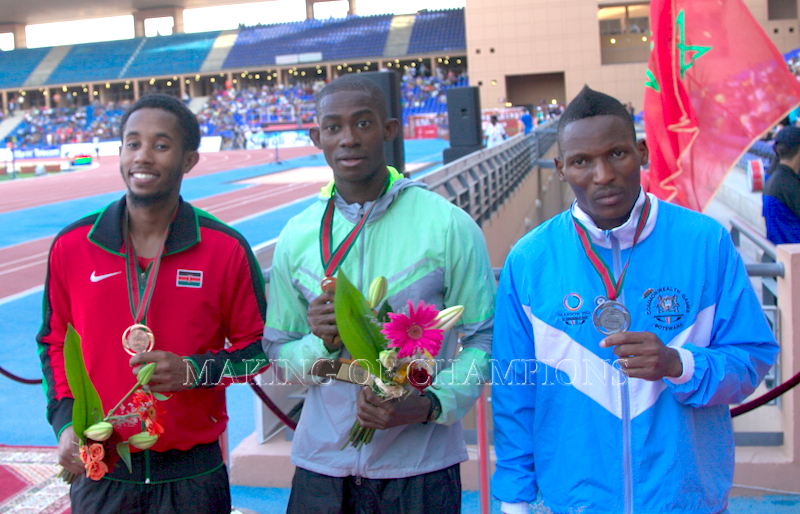 Another Ivoirian, Hua Wilfried Koffi took over the baton from Meite at the 2014 African Championships in Marrakech. He surprisingly won the sprints double with a Personal Best (PB)/ National Record (NR) of 10.05s in the 100m and 20.25s in the 200m, putting his name in history as the third man to achieve this feat in the Championship history. What is most surprising in his feat is that he trains alone in China, while his coach is in Germany, and their only means of communication on his training program is via email or text messages. While Meite and Koffi may have stamped their country’s name in African men’s sprint history, Murielle Ahouré has done it for the females internationally. In fact, she is the most celebrated sportsperson their nation has produced in a decade after their football national team and is nicknamed the ‘female Drogba’ in her country. Ahouré sprang unto the international scene in March 2012, where she came 2nd (7.04s) in the 60m at the IAAF World Indoor Championships. She became her country’s first medalist at an IAAF World Championships of any age or competition. She then went on to become the sixth African sprinter under 11s when she ran a 10.99s, before making the 100m and 200m final at the 2012 Olympic Games, finishing 7th and 6th respectively. 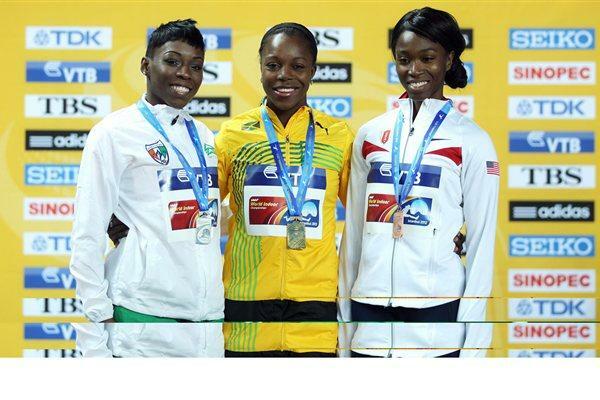 Murielle Ahoure won Silver in the 60m at the 2012 World Indoors behind Jamaica’s Veronica Campbell-Brown (C), while Tianna Madison of Great Britain (R) took bronze. 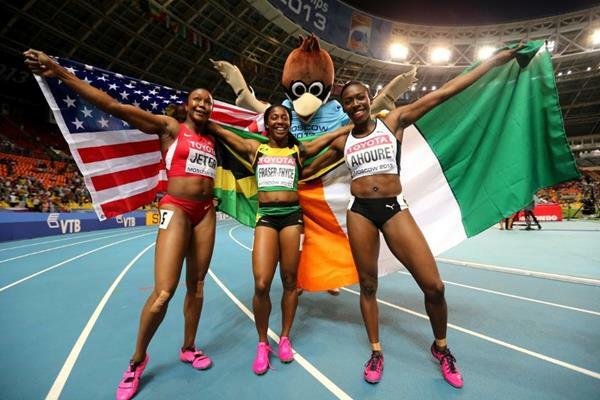 Murielle Ahoure celebrates her 2013 World Championships Silver medal along with 100m champion, Shelly-Ann Fraser-Pryce and bronze medallist, Carmelita Jeter. 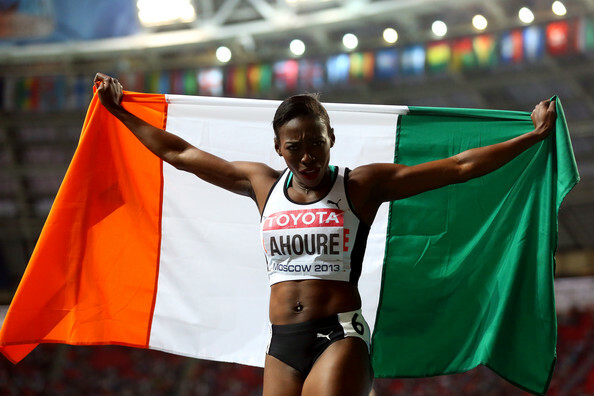 At the 2013 World Championships in Moscow, Ahouré made history by becoming the first female African sprinter to win a medal in the 100m when she snatched the Silver in 10.93s, before making it double Silver in the 200m in 22.32s. Her achievement in Moscow was undoubtedly a highlight of the 2013 World Championships, especially considering that she won Cote d’Ivoire’s first medals ever in the event! She won the attention of the world, the admiration of Africans, and the adulation of Ivoirians. The emergence of Cote d’Ivoire now poses a threat to traditional African power house, Nigeria, which has produced the continent’s best sprinters over the past few decades, such as Olapade Adeniken, The Ezinwa brothers, Mary Onyali-Omagbemi Olusoji Fasuba, Deji Aliu, Blessing Okagbare and many other notable athletes. 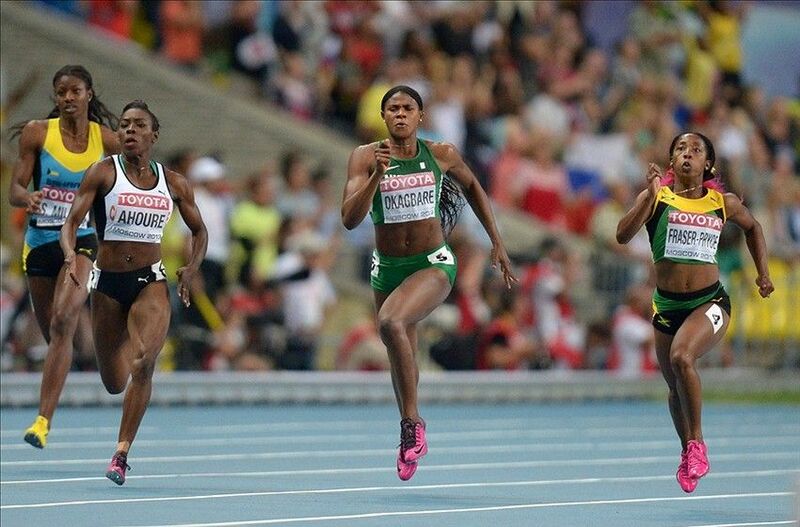 For instance, at the just concluded African Championships, Nigeria had three finalists in the women’s 100m final, yet only Okagbare made it to the podium with a GOLD medal, while Ahouré and Marie-Josée Ta Lou (another emerging Ivoirian star) shared the remaining spoils. 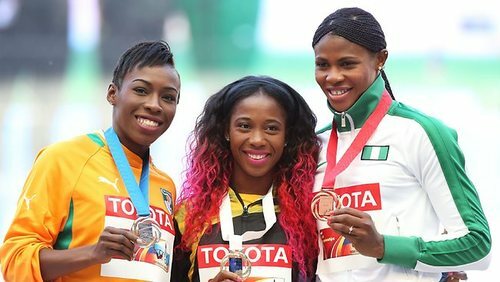 It was the same story in the 200m as the Ivoirian duo dominated once more, while Dominique Duncan emerged the surprise bronze medallist for Nigeria. 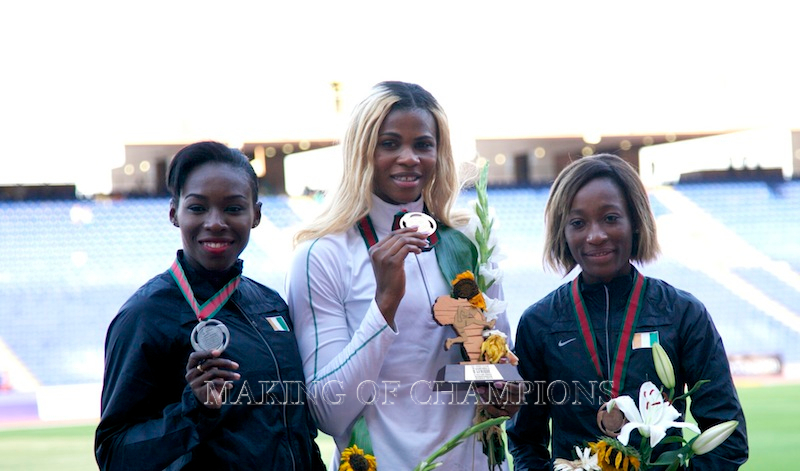 Okagbare was Nigeria’s sole medallist in the women’s 100m final, while the Ivorian duo of Murielle Ahouré and Marie J Ta Lou won silver and bronze respectively. 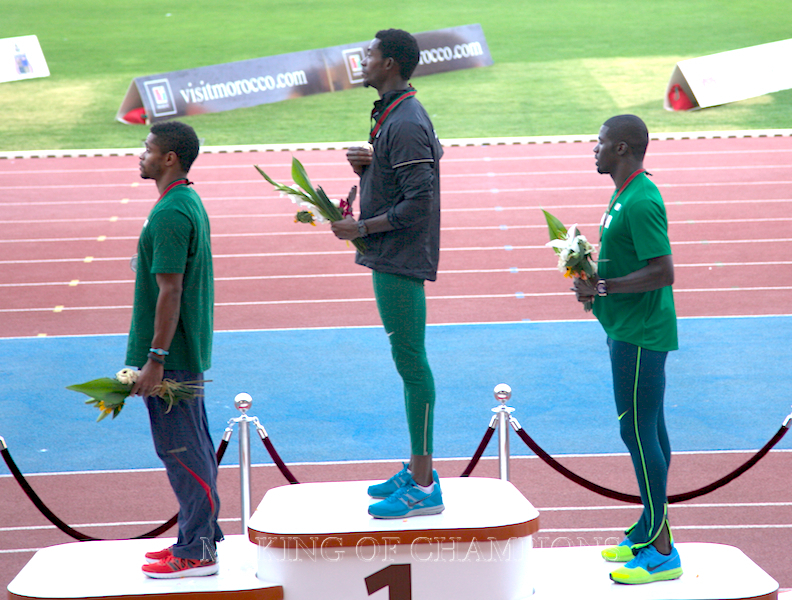 Men’s double sprint champion, Hua Wilfried Koffi won gold ahead of the Nigerian pair of Mark Jelks and Monzavous Edwards. In the men’s event, Koffi was the lone Ivoirian but he beat three Nigerians (Mark Jelks, Monzavous Edward and Ogho-Oghene Egwero) to the 100m title, and repeated the same feat in the 200m where Nigeria’s sole finalist, Divine Oduduru placed sixth. The steady rise of the Ivoirians should serve as a note of warning to Nigeria, which is fast losing her global relevance as a force to contend with in the sprints! Meite, Ahouré and Koffi have set the pace for their country; it’s just a matter of time before more Ivorian youths follow in their steps. (Photo Credit: Christopher Lee/Getty Images). (Photo Credit: Julian Finney/Getty Images).